This field trip, Dairy Cheer. It is an eastern Kentucky chain and by chain I mean there are 2 in Pikeville, one in Prestonsburg, and one in West Liberty. 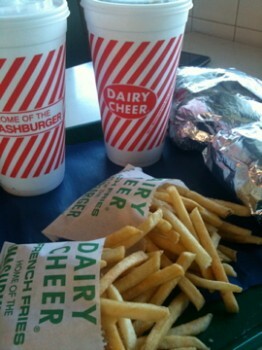 After home softball games one of my coaches took us to Dairy Cheer. I always remember getting a blueberry milkshake made from blueberry ice cream where the blueberries were fake. Kind of purple and small and gell like…totally gross to think about now but man I loved that. In recent years when I lived in Whitesburg and was able to go to Dairy Cheer more regularly, I would get the swirl cone, Orange icey soft serve swirled with vanilla soft serve for a kind of creamsicle effect. Really good and something I’ve never really seen anywhere else. Now I have to admit, the last time I ate an actual meal at Dairy Cheer I woke up with terrible stomach pains. 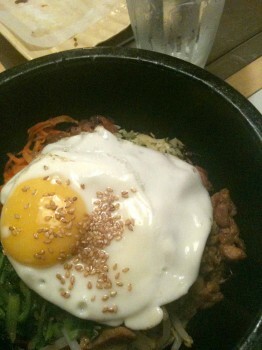 This time I did not get sick but the food is not that great. The burger was really overcooked and I’m not entirely sure how much actual meat was in it. I also had trouble telling what made it a Smashburger, I can’t remember from my youth, and I couldn’t really discern any special sauce or anything. The fries were great and I saw some onion rings come out that looked amazing. Unfortunately I was too full for the swirl action, which is really yummy and refreshing. I’m going to have to accept that the food here is more nostalgicly good rather than actually good. It’s a real bummer because I feel like most of the greasy spoons and diners back home have gone this way because people would rather eat at the chain restaurants. They think it is inherently better because it is not from home. This Tuesday Field Trip happened last Thursday evening. After coming back straight to Farm to Table preparation and execution my mind forgot that I was on vacation the week before. It’s also sometimes hard to consider time with loads of family actual vacation. You don’t really get to check out at all, so I needed a little tiny break. I turned off email, left the computer at home and we went to Asheville, NC for the night. Thus far my favorite things about Tupelo Honey are 1) 99% of the time I call it Uncle Tupelo, still one of my favorite bands, and 2) I remember a tomato sandwich there at 2AM one drunken Saturday after a Southern Foodways Alliance event. I haven’t really been there since for a meal other than breakfast, which never stood out to me. Now I have a third, dinner! After traipsing around and seeing most kitchens closed or closing we ended up here for dinner. It was spectacular. 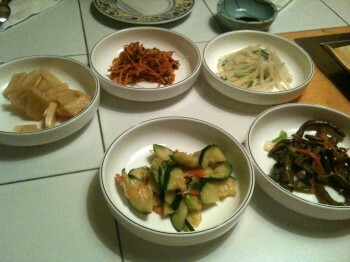 Very simple dishes, well, at least dishes based on the memories of simple down home dishes. I had fried chicken. But it was nut breaded fried chicken with white gravy served on sweet potato mashed potatoes and I had a side of brussell sprouts.Â It was so fresh and delicious. Carlos had stroganoff made with pork, local mushrooms, goat cheese grits and some pesto. It was also amazing. Not quite as heavy as you might think. From my experiences in Knoxville, we don’t have anything like this. Good, fresh, southern food. I love southern food. I want to eat it but I want it made with local, farm fresh ingredients. It’s one of the big holes in our eating scene here. Southern food is a special thing, just look at the number of restaurants featuring this kind of food in New York City! Today’s field trip did not take me far. Just down to Gay St. to the French Market, which has been open a couple years now. Despite it’s central location to most of my life, downtown, I hardly ever remember to stop in. They serve brunch and have savory crepes in addition to pastries and other goodies. The inside of the shop/creperie is really beautiful, marble counter tops and lots of natural lighting. The couple that works behind the counter are super nice. I’ve eaten here once before for lunch and was surprised by the extensive menu. For lunch I remember having a buckwheat crepe filled to the brim with vegetables and cheese. Today I did the traditional sugar and butter crepe. The crepe today was really well done, it was light and airy and browned evenly. There was, however, way too much sugar and butter, which one may argue is not possible. On one hand I tend to agree with this argument, on the other hand in my mind the point of a sugar and butter crepe is to have something a little lighter than say Nutella or another heavy filling. My memory of these in Paris (which granted could be totally turned around…) is a light dusting of sugar rather than what seemed like a dumping of sugar. Either way it was really yummy. I will say that between the sugar and the crepe and the coffee this is the first time I haven’t felt tired in weeks! Our Oregon tour ended on Sunday in Portland. I may be one of the few people in the world who is not a fan of Portland. It’s a little too much on all fronts. Yes there are tons of cool shops, restaurants, food carts and people are nice, but I am not a fan. Part of the reason I think is I am always there after being on the river for a few days and it is so beautiful and practically perfect down there that the city seems to feel like a let down. With that being said, we did have a great field trip dining experience while there at Le Pigeon. I’m not sure how I came across this place, probably Gourmet or Chowhound, but I was excited by the experimental menu that changes frequently and has some offal components. Offal according to Wikipedia is a term used to refer to the entails or organs of a butchered animal. The place is small there is table seating for about 20 and then 10 more seats at the bar which overlooks the place where all the food is prepared. It’s cozy and warm and lovely. The menu is equally brief, maybe 12 items, half starters and half mains. The 5 desserts and cheese plate were listed on a board. We started with Pork Belly with green beans, cashews, and mushrooms. It was amazing and really my favorite dish. There was an Asian flare to the sauce, sweet, salty, and gingery. Our other starter was Sweatbreads that were fried in a walnut batter that really had the effect of a cornmeal batter. It was not heavy or thick. The Sweatbreads were served with an amazing cold beet salad and a what seemed like a blue cheese cream. This was my second favorite. It was so good. The various textures from the Sweatbreads to cold but cooked beets, to blue cheese complimented each other perfectly. The colors were beautiful and the flavors exquisite. Sweatbreads can be awful. These were fabulous and it wasn’t just because they were friend. The batter was, and this is rare in my Sweatbread experience, secondary. Our main courses, Duck with fresh figs and leeks and Beef Cheek Bourguignon were both good but not nearly ask good as the starters. My duck was overcooked a bit, but was served with these little fried potato balls that were awesome. The Beef Cheek while amazing in flavor would have been hard for me to eat more than a bite of. It was a big punch of red wine and beef in equal amounts of force. Finally for dessert, Honey Bacon Apricot Cornbread with Maple Ice Cream and an Olive Oil Cake with Goat Cheese whipped cream and Plum sauce. These were both pretty excellent although I liked the Olive Oil cake better. Neither of them were very sweet but the cornbread, well wasn’t really cornbread and was too dry. 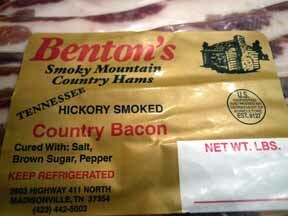 The bacon and apricot together however were lovely flavors. The evening of amazing food was of course rounded out by lovely conversation about what makes a good place amazing (otherwise known as, why doesn’t a place like this exist in Knoxville), family dynamics (or congratulations to my boyfriend or surviving 20 Sohns all at once), and what were some of our best meals of the year since clearly we were in the middle of one on Sunday!